* $400/cabin free prepaid cruise gratuities for the 9-day cruise. * $2500 Value free unlimited beverage and drinking package (Selected cabin only). * ONLY USD $550 per person to join the Berlin,St' Petersburg and Stockholm Tour Package at half price (original USD $1100). Take the flight to Copenhagen. Welcome to Copenhagen, the capital city ofDenmark and one of the most popular citiesin Scandinavia. After arrival, travel along thesea shore of North Sealand; enjoy wonderfulart, architecture and sea views. Tour the exquisiteKronborg Castle in Elsinore, which is one of northern Europe's most important Renaissance castles, known all over the world from Shakespeare's Hamlet. It is a UNESCO World Heritage Site that fortified the entrance to the Baltic Sea for six centuries. After lunch, transfer to the hotel and have a rest. Enjoy a delicious breakfast at the hotel and then get ready for a city tour of the beautiful Copenhagen. Visit the famous The Little Mermaid statue which was unveiled at Langelinie in 1913. The small and unimposing Little Mermaidstatue continues to remain as Copenhagen’sicon and major tourist attraction. Then, visit Nyhavn, a former commercial port with colorful architecture and restaurants, to enjoy the relaxing atmosphere created by the canal, jazz music and great food. Danish author Hans Christian Andersen lived at Nyhavn for about 18 years. Next, visit Rosenborg Castle, a royal hermitage in King’s Garden in the heart of Copenhagen. It features 400 years of splendor, royal art treasures and the Crown Jewels and Royal Regalia. After that, explore the City Hall, an impressive grand building with gorgeous red bricks. Enjoy Carlsberg brewery, founded in 1847, here you can learn about the history of Carlsberg brand, the beer brewing process and taste the freshly brewed Carlsberg draft beer. Afterwards, we will head to the port to board Norwegian Cruise Line’s Norwegian Getaway. Enjoy outstanding cuisine, fun entertainment, and much more. Today, you will may enjoy your time on the cruise or join our optional Berlin Tour. You will be picked up at the port. After a scenic ride through the idyllic flatlands of North Germany with its hundreds of lakes, you will be warmly greeted at the former West Berlin by your tour guide. You’ll start with Charlottenburg Castle, a splendid baroque palace, dating from 1695. Along the way you will see the Berlin Cathedral, the tree-lined “Unter den Linden” boulevard, Museum Island, Bellevue Palace, Victory Column, the Kaiser Wilhelm Memorial Church and of course some notorious sights of the Third Reich and Cold War, such as Hermann Goring’s Aviation inistry and the former site of Hitler’s Bunker. The fall of the Berlin Wall in November of 1989 was a conspicuous and symbolic end to the era of the "Iron Curtain". Experience history first hand and visit Checkpoint Charlie, more well-known as the crossing point between East Berlin and West Berlin during the Cold War. Last but not least, visit the Reichstag, the German Parliament and explore the magnificent Brandenburg Gate, the most prominent and splendid landmarks in Berlin. The Brandenburg Gate is symbolic for the reunification of the two sides of this great city and serves as a historic landmark. Enjoy the amenities onboard when you cruise at sea. The complimentary dining options on your cruise include three main dining rooms, a help-yourself buffet and a variety of casual cafés, grills and on-the-go choices. Main Dining Rooms offer a menu that changes daily. Today, visit capital and the largest city of Estonia, Tallinn. The historical Tallinn is also the most well-preserved medieval city in Europe and a UNESCO World heritage site. First you will see the Estonian Parliament and make a visit to Alexander Nevsky Cathedral, an orthodox cathedral in the Tallinn Old Town. It was built in a typical Russian Revival style during the period when the country was part of the Russian Empire. Crossing into the old town of Tallinn, it seems that you travel through time and find yourself on the cobbled streets of a medieval village. Here you will see merchant houses in Gothic style and St. Nicholas & Holy Ghost Churches. In the heart of Tallinn, you can admire the 15th century Town Hall and one of the oldest pharmacies in the world, located on the Town Hall Square. Town Hall Square has been the center of this town since the middle ages. It is filled with many outdoor cafes, medieval festivals, open concerts and much more. The most magical time of the year will be during Christmas when locals celebrate old traditions that dates back to 1441. You will visit the Kohtuotsa viewing platform as well as the Tallinn Town Wall, which provides one of the best views over the medieval fortifications. And don’t miss out on trying delicious roasted almonds and Vanna Tallinn, the famous Estonian liquor. You will cruise by St. Petersburg this morning, Russia’s second largest and second most important city. 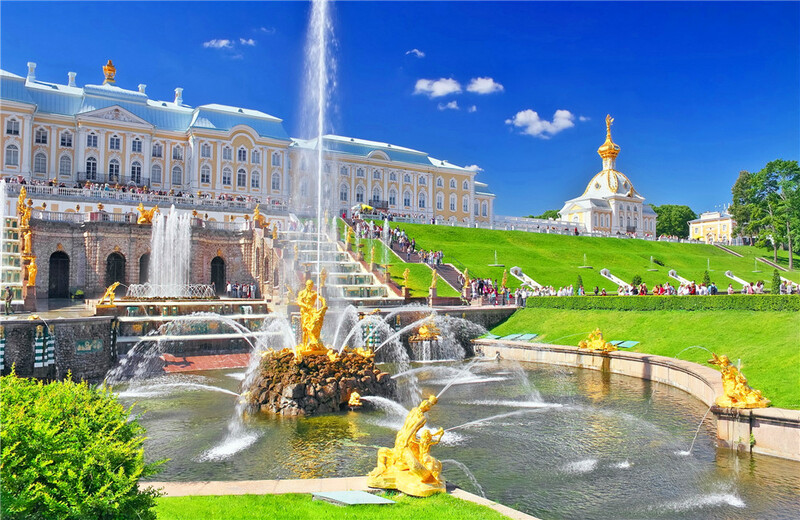 Enjoy the excursion to Peterhof, “The Russian Versailles”, where you can see the beautiful lower park and remarkable array of decorative fountains outside the palace. Perhaps the greatest technology achievement of Peterhof is that all of the fountains operate without the use of pumps. Water is supplied from natural springs and collects in reservoirs in the Upper Gardens. Then you may visit Catherine Palace to marvel at many lavish chambers, such as the famed Amber Room. Then the tour guide will lead you to St. Petersburg Metro, which will be undoubtedly one of the most beautiful underground railway systems you have ever encountered. It’s also worth a visit to the Rabbit Island where the tsars are buried. There are several interesting places. Visiting the Peter and Paul Fortress is an important part of every tour of St. Petersburg. The Peter and Paul Cathedral is one of the main architectural dominants of St. Petersburg. A 122.5 m. (401.90 ft.) tall spire of the cathedral has a guardian angel on its top, and it serves as a one of the official symbols of St. Petersburg. Today, explore St. Petersburg further. 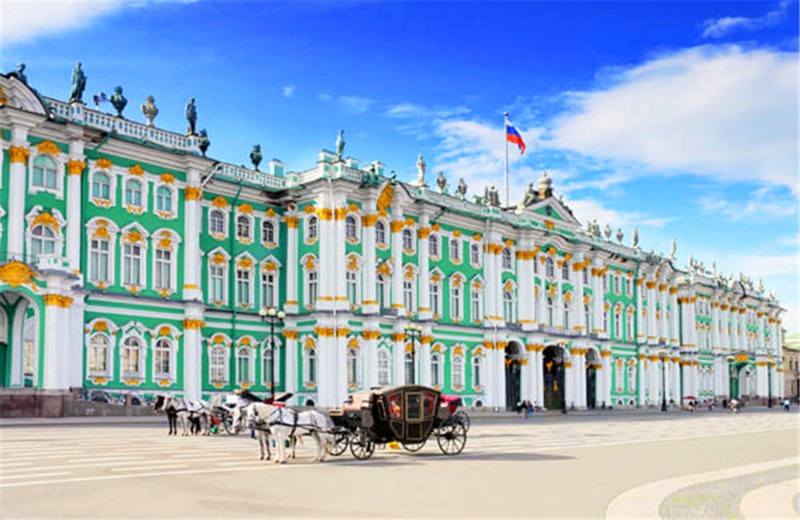 State Hermitage Museum is on the first position of the “must-visit” list. The largest museum in Russia is a real treasure of world culture, collection of the best works of art – all this is true about The Hermitage Museum. Then, continue to visit another landmark of St. Petersburg, the Church of Our Savior on the Spilled Blood in Russian National Architectural Style, which offers an amazing contrast to the Baroque and Classical architecture predominant in central St. Petersburg. Afterwards, head to the Senate Square (Senatskaya Ploshchad), the site for the famous statue, the Bronze Horseman. Take a stroll along Nevsky Prospekt. In addition to being the center of modern living and entertainment, Nevsky Avenue features a host of historical and cultural attractions that worth visiting. Today, our ship will be anchored at the capital of Finland, Helsinki. From the scenic seaside views to the cutting-edge architecture of the city center, the sceneries of Helsinki are all unique and special. First, take a visit to Sibelius Park, a famous Helsinki sight. The Sibelius Monument consisting of hundreds of steel pipes was erected to honor the great Finnish composer Jean Sibelius, who helped Finland develop its national identity during its struggle for independence. Thereafter, you are going to visit the exceptional venue of Rock Church. This unique church is a highlight for most visitors to Helsinki and is considered to be one of the Europe’s most interesting house of worship. Carved out of solid bedrock from the side of a mountain, the church hall is topped by a remarkable copper dome. The interior is beautifully bathed in natural light entering through the glazed dome and used frequently as a concert venue due to its excellent acoustics. We will also pass by the largest orthodox church in Western Europe, the Uspenski Cathedral, Market Square and the heart of the Finnish capital city − Helsinki Central Railway Station, clad in Finnish granite with its distinguishing feature as the clock tower. Stockholm, the capital of Sweden is an ancient city in Sweden built on 14 islands connected with each other by 57 bridges. Despite the fact that the city is spread across so many islands, Stockholm is quite compact and can be easily seen in a day. Join the optional tour today and you will have the opportunity to visit the Blue Hall, which is the main hall of the Stockholm City Hall and is best-known as the banquet hall for the annual Nobel Banquet. The city tour also includes the island of Djurgården, where you will see the most-visited museum in Stockholm – the Vasa Museum. The museum has one of the most well-preserved old ships, Vasa, that was once built to be the most powerful warship in Sweden. Vasa foundered after sailing about 1,300 m into its maiden voyage on 10 August 1628. It was salvaged in the 20th century and restored to its original appearance. Then, explore the Royal Palace in the northern part of the island, the official residence for the King of Sweden and one of the largest residences in Europe. Afterwards, you can enjoy your free time wandering in the old town at leisure, shopping for souvenirs or purchasing some snacks. Today you can enjoy the entertainment facilities as well as the flawless service since the ship is a multi-functional vessel setting accommodation, catering, entertainment, business and shopping all together. To enrich your onboard life, onboard theaters will continue performing some classical performances and operas, especially the famous Broadway show Burn the Floor. And all kinds of shopping centers on board will definitely meet your shopping needs. The ship returns to Copenhagen today and your holidays ends with breakfast this morning. You will be transferred to the airport and fly back to your sweet home. • Tour prices are subject to change without prior notice. Please check with your travel agent orour website for the latest information. ONLY USD $550 per person to join the Berlin,St' Petersburg and Stockholm Tour Package at half price (original USD $1100).